We understand the budgetary challenges and financial hurdles that are presented to students as they strive to achieve their educational goals. Our hope is that through the use of CheapScholar.org’s College Resource Center we are able to take the guesswork out of the financial aspect of this journey and arm students with information and tools that will help them fulfill their educational dreams. Now Introducing the Sleeker, Newer, Updated FAFSA! Getting The Perfect Work Study Job! Should You Use Retirement Savings For College Expenses? Comparing College Costs – Don’t Forget The Toilet Paper! 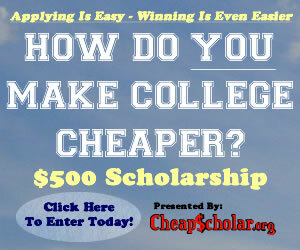 Want To Avoid Tuition Increases? Here Are Five Tips! Should Parents Pay For Children’s College Education? Type your question into the following search box and we will try to match it up with one of our informative articles. You can also drop us a line anytime and we will be more than glad to help.